Winger George Boyd outlined the importance of Burnley’s goal-scoring diversity in the Premier League this season following the 3-2 win over AFC Bournemouth. 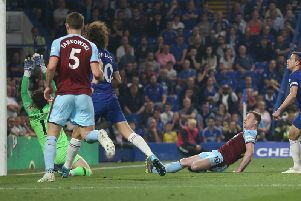 The 31-year-old scored his first goal since the Clarets clinched the Championship title against Charlton Athletic at the Valley to become the 11th player in the squad to get on the scoresheet. The former Hull City man joined leading scorer Sam Vokes, Andre Gray, Ashley Barnes, Dean Marney, Jeff Hendrick, Scott Arfield, Johann Berg Gudmundsson, Steven Defour, Michael Keane and Stephen Ward on the list. Boyd profited from Gray’s clever pass in the 75th minute at Turf Moor, driving into the area before firing low across Artur Boruc and into the far corner. “It’s nice to get that monkey off your back and it came at a good time because it gave us that two-goal cushion,” he said. “I think we fully deserved it. “They started really well to be honest and put us under a lot of pressure. “But Jeff (Hendrick)’s goal was fantastic and took some of the pressure off. Burnley are sharing the load in terms of goals, and he added: “It’s massive, and last time we didn’t have players scoring from all angles. “It takes the pressure off the strikers with Jeff and Wardy scoring, Marney last week, so it’s good that we’re scoring from all positions. “It’s definitely a positive that we’re scoring from everywhere.